Annie’s Books Online is a section of Annie’s Resource Attic which has the main books from the various activity sets in HTML format. I’ve started this section to support users who do not have multimedia applications that can display movies, play sounds, and handle activities with a non-linear structure. You can see all the action in these online books by going to them from your browser, just as you would go to any other web page. For example, if you have been downloading the books in PDF format, you have not heard the sounds or seen the movies. With this option, you can go through the books online and experience all the multimedia features. Then you can print out PDF versions to use off computer, and download Word® or PDF format tests and writing exercises to complete the activity set. This page is an index to all the online books, although they are also accessible from the main post for each activity set. In addition, below the index you’ll find a general description of book structure, and helpful tips about what’s required to use these books successfully with whichever browser you are using. Books marked as will play their sounds on iPad! The limitation is that iOS is set up to NOT automatically play sounds, so sounds must be initiated by a button touch (click). For this reason, sometimes you hear a sound when you click a button, but there’s a slight lag before you see what made the sound as the next page opens. If you are using iPad, be sure to click any Play Sound button, because it’s probably a background or ambient sound that would play automatically on other devices. Also look for books marked as having updated movies (marked HTML5), and those that have no movies, as these should work well on iPad. As of 2017, browsers no longer support classic QuickTime movies. This means none of the movies will run in the online books written 2016 or older until I get them updated to a modern format. All books written after 2016 will include the new formats for both video and audio, be written in HTML5, and no legacy version will be supplied. The good news is that once updated, movies in online books will play on tablets and phones, and also play in Desktop books without an internet connection. I began with the newest online books, Log Cabin and ShowerTime! and I am continuing to convert older books to HTML5 so that both sounds and movies will play on all devices. Books that have been converted are marked in the index list below. Just in case anyone is stuck with a very old browser, pre-IE9, I’m retaining old versions of online books 2016 and before that had embedded sounds and QuickTime movies. I’ve put in code that will detect your old browser and automatically switch you to that old version. However, I really have no way to know if movies will play for you. 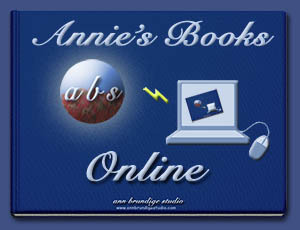 Finally, if you have a slow connection, you might want to check out the Annie’s Desktop Books page for download links so that you can run the online books on your local computer or network. Currently, I’m working toward converting the desktop books to HTML5 because that format will handle sounds more reliably, plus I can include updated movie formats that don’t need an internet connection. If an online book is marked , then its desktop version is also HTML5. Applications needed: Any modern web browser. Animals Books link: animals/index.html Link goes to a menu with links to two online books: What I Like Best About Animals and The Animals Game. , audible text, and updated movies. Bird Math Books link: countingBirds/index.html Counting Birds, Adding Birds, and Subtracting Birds activities to read online. and updated movie. Pre-IE9 legacy version also online. Gingerbread House Book link: gingerbread/index.html Book lets you choose frosting, window styles, and roof styles to decorate 27 different gingerbread houses. Golf Story Book link: golfStory/index.html Funny book about a typical day in the life of a golf ball. Good choice for older students and adults needing a book with a simple vocabulary but an age appropriate subject. No movies, has audible text. Holiday Tree Book link: holidayTree/index.html Book lets you choose ornaments to decorate 27 different holiday trees. Jack-‘O-Lantern Book link: pumpkin/index.html Interactive story lets you choose features to construct nine different pumpkin faces. so sounds play on iPad! No movies, has audible text. Pre-IE9 legacy version also online. Jason’s String Books link: jason/index.html Link opens a menu with buttons to open Jason’s String, a book about a cat’s favorite toy, and Ing Is A Powerful Thing, a phonics book. so sounds play on iPad! Updated movies, has audible text. Pre-IE9 legacy version also online. Little Toot Book link: toot/index.html Book about the cutest little boat you have ever seen! Movies require QuickTime. Log Cabin Books link: logCabin/index.html Menu leads to two books. In Log Cabin build a log cabin using virtual Lincoln logs, then imagine yourself inside. Beware of the bear! In Fill The Shelves practice with direction words while helping to tidy up the cabin by putting items back on the shelves. so sounds play on iPad! Updated movies, has audible text. Pre-IE9 legacy versions also online. Madagascar Adventures link: madagascar/index.html Tour five different ecoregions of Madagascar. Five books in one, with a Madagascar map menu page. See the strange plants of the Spiny Forest, giant spiders and other creatures in the Dry Forest, lemurs and a fossa in the Wet Forest, rare birds on a tiny island, and be surprised by creatures of the night. and updated movies. Extensive audible Glossary! Pre-IE9 legacy versions also online. Madagascar Lemur Books link: madLemur/index.html Link goes to a menu with links to two online books: Lots Of Lemurs and Islands. Bonus button leads to a page where you can try out the sounds of valiha, the folk instrument of Madagascar. and updated movies. Extensive audible Glossary! Pre-IE9 legacy versions also online. Making A Pumpkin Pie Book link: pumpkinPie/index.html Life skills story showing the steps in making a pumpkin pie. Recipe on the Credits page 🙂 Movies require QuickTime. Mayan Jungle Adventure Books link: mayan/index.html Link goes to a menu with links to two online books: Mayan Jungle Adventure and Fact Or Fiction? so sounds play on iPad! Updated movies, has audible text. Pre-IE9 legacy versions also online. Pablo Pelican Books link: pelican/index.html Link goes to a menu with links to two online books: Pablo’s Bad Day and Pelican Facts. so sounds play on iPad! Updated movies, has audible text. Pre-IE9 legacy versions also online. Showertime! Book link: showertimeWeb/index.html Interactive story Showertime! about gathering supplies to prepare to take a shower. and updated movies. Pre-IE9 legacy version also online. Snow Books link: snow/index.html Menu page with links to two books to read online. Movies require QuickTime. Sofie Sea Lion Books link: seaLion/index.html Link goes to a menu with links to two online books: Sofie’s Adventure and Sea Lion Facts. so sounds play on iPad! Updated movies, has audible text. Pre-IE9 legacy versions also online. 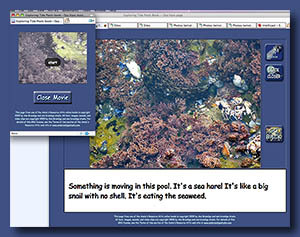 Tide Pools Books link: tidePools/index.html Menu page with links to the three Tide Pools books to read online. Movies require QuickTime. The Haunted Castle Book link: haunted/index.html The Haunted Castle book to read online. Sounds require up-to-date QuickTime in FireFox (Win). Visiting A Petting Farm Book link: pettingFarm/index.html Explore the farm, choosing your own route, petting the animals, feeding them, and hearing them react. Movies require QuickTime. Wrapping A Gift Book link: giftwrap/index.html Activity to read and complete online. Plan to print the final page. Click here for extra help with this activity. The books have large graphics, so allow a few seconds for each page to load. Once you have been through a book, you should be able to go through it faster if you read it a second time. If your browser loads slowly, the movies may be jerky the first time they play, since they are loading while playing. Play a movie again using the movie controller, and it should run smoothly. Since they need large sized text and a generous graphic, book pages may scroll off the bottom of the screen. This may hide navigation buttons. To avoid this, temporarily close your browser’s bookmarks and navigation toolbars to gain some space. You can do this under the View menu. Don’t use full screen, though, because movie pages would play behind and not be visible. Books marked as having updated movies use codecs H.264/AAC and should play on all modern devices. The movies in desktop versions of these books should play without an internet connection. Be careful not to click the main page right after clicking a Play Movie or Look Closer button. The floating window is set to open on top, but if you click the main page, that selects it and will jump it in front of the movie page. If this happens, slide the main page aside and click the movie page to make it come to the front. As of October 2015, new online books will be written in HTML5 to take advantage of its more reliable handling of sound and video. Books will play in modern browsers including Mac Safari 5.0 or later, iOS Safari 4.3 or later, Firefox Mac or Win 39 or later, Internet Explorer 9 or later, and Google Chrome Mac or Win 12 or later. Users of Windows XP with IE 8 or earlier will be automatically switched to an alternate version using an earlier html and utilizing a sound manager based on Flash®. If you find that online books load slowly, try downloading a desktop version of the same book. You can run it with your browser, and everything will load immediately! 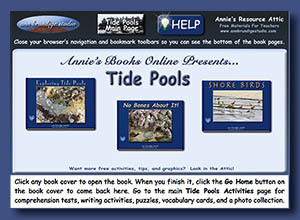 For details and download links, check out the Annie’s Desktop Books page. You need QuickTime® installed to see the movies in the old (Pre-IE9) versions of these books, and I don’t guarantee movies will still play online , even with QuickTime installed. If you have iTunes® installed, then you already have QuickTime. You can test if your system is ready to run the movies in the books by looking at the movie near the bottom of this page about a kingbird nest. If you need to install QuickTime, click here to go to the Apple Computer® site, download QuickTime for your operating system, and install it. A typical online book page has a photo or original art and under that a text area with 24 or 36 point text on a white background. Buttons lead to other pages, either next and previous or jumping to multiple locations. If there is a movie, it will open in a floating window. Click the black button on the movie to play it, and close the floating window when finished. Floating windows are also used for other information. In some places, a button lets students look closer, or explore additional information about what’s on a page. 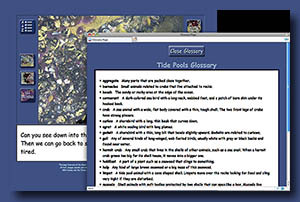 Another use of the floating window is to provide a glossary that can be opened from any page. These extra information windows usually appear in books written for older students, particularly science books. Simple story books might not need these at all. For navigation, the link to a set of online books leads to a menu page with several book cover buttons. Clicking a button opens a book, and on the book cover is a Go Home button to return to the menu page. An online books menu page will also have links back to this help page, to the main post for the activity set where tests, writing activities, and other resources can be downloaded, and a link back to the Welcome page of Annie’s Resource Attic. I love your books, but I am having trouble getting them to play as a movie. When I open them online, I can see them as a slideshow, one frame at a time by clicking on the red arrow to move to the next page. Some books have sound (the text is read aloud and I can hear the sound effects), other books have no sound. How do I play them as a movie? I was able to do that with the sea lion book (there was a button that said play movie to click on), but the other books I looked at did not give me that option. I have downloaded some to my desktop, and I have the same issue – they will open one frame at a time, no sound or movie option. Where are the pdf files for the books? You mention on the instructions page they can be downloaded as a pdf, but I can’t find the pdf format. The books online are not intended to play as movies. They really are online books, and students must turn the pages by clicking or touching the red arrows. I purposely made the navigation controls large, because some of the students who read those books have low vision. Some students may stay on one page for a while, if they need extra reading time or maybe just like the illustration. There ARE movies to play with some books, including the one about Sofie the sea lion, but those pop up a separate page for the movie, which will be a short QuickTime movie. (Or, since QuickTime is no longer supported on the web, a short movie in a format supported in HTML5.–added in 2018). These short movies only further illustrate the text on the page where you see a Play Movie button, they aren’t the entire book. Each book or set of books has a link to the main page for that activity set either on the left sidebar or at the top of the menu page for sets of books. At the bottom of the main page are links to download A PDF version, a desktop version in html that will play in your browser when you are offline, and often sets of photos from the book.